Before washing the outside of your car, spray water first for a while. This is done to clean the remaining chlorine or other chemicals that can damage the body paint of your car so that it can become dull. Don't forget to close the window and door parts of the car tightly so that the water does not enter the car. Spray water on the body of your car first to clean the dust and sand that is attached. Do not clean dust and dirt before washing the car, this can cause your car body to be scratched. Use a special car cleaner or car shampoo. Start to wash the car using a sponge that has been given car shampoo. The correct way to wash a car is to wipe the sponge from the top to the bottom of the car in a circular motion. This is so that the clean parts of the car are not exposed to other dirt. Wipe slowly so as not to damage your car's paint. But you need to be deft so that the water and car shampoo don't dry before the rinsing process. After feeling clean, rinse the car using clean water. After that, dry the car using a clean cloth and make sure there is no dirt that is still attached which can damage the body paint of your car. Look for a shade to wash the car, this is so that the car can avoid direct sunlight which can cause shampoo and water to dry quickly before you rinse it. Use the right car shampoo. Look for car shampoo that has a balanced pH quality (pH 7). In addition, make sure the car shampoo you use has high clean power and lubrication, contains a whitening agent (a substance that makes the car look shiny), does not remove car paint protectors, contains water softener, and others. Do not use used sponge mattresses or upholstery to wash the car because it can damage the car body. You can use special sponges to wash cars that you can find in stores. Use a microfiber cloth to dry the car body. If you want to clean the inside of the car, try to clean it before you wash the outside of the car. For the inside of the car, you don't need as much water as you clean the outside of the car. You only need a little water mixed with car soap to clean the inside of the car. The inside of a dirty car is usually caused by food scraps, footwear traces, and others. Do not use car soap containing bleach to clean the inside of the car. You can use a sponge or cloth to clean the inside of a dirty car. After cleaning, wipe dry with a microfiber cloth. The car engine is the most important and sensitive component of the car. When you are going to wash it you need carefulness and the right way to not damage the car engine. The following are the right steps to wash the engine parts. To remove oil stains such as oil droplets that are attached to the car's engine, you can use dab or kerosene to clean it. After all parts of the machine are clean, rinse with clean water then wipe dry. the last process of washing a car is cleaning the tire parts of the car. Car tires are one part of the car that directly interacts with the road surface or the ground. Therefore, car tire parts are often easily exposed to dirt, dust, soil or mud. To clean the following below, the steps for washing the tire are correct. We recommend that you do not clean the tires and under the car if the engine condition is still hot, this will cause water spots on the car wheels. Wait for the engine to cool down first. Use a cleaner with a stronger material on the tire because it can lift dirt that is firmly attached. Wet the tire part of the car with water. Then wash the car parts starting from the wheel, ve; g, spark board, car foot and other parts that you can reach. You can use a brush with a foggy model for dirt that is hard to clean. After all parts have been cleaned, rinse with clean water. Then dry using a dry, clean cloth. Do not use the same cloth as the cloth you use to clean the body parts of the car. After finishing washing the car, you can use polish so that your car looks new and shiny. So that it can further enhance the appearance of your car. You can also use silicone paint coatings to keep your car's paint colors from fading. This car paint protective function can prevent dust and dirt from sticking to the car body. Use rain X or a type of water-repellent liquid that you can use on the windshield of your car. The function of this liquid can protect your car's windshield so that your vision to the street is not disturbed. You can use it every few months especially if you are often exposed to wiper friction. remove car parts that are exposed to rust. You can use rust crushing liquid. Clean first the affected part of the rust then apply rust and wait until it dries. If after washing you feel there are still particles sticking to the car body, you can use clay bars to clean your car. Now that was the steps for washing the car properly and correctly. It's easy isn't it? it's just that some caution is needed on important components. If you don't have a lot of time, you can wash your car in car salons. 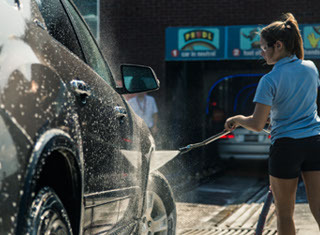 There your car will be cleaned directly with professionals so the results will be guaranteed. Hopefully the information above can help you. Good luck. 0 Response to "22 How to Wash a Car to Be Shiny"